The eHRMS application was to facilitate the proper monitoring, manpower planning, recruitments, Postings, Promotion, Transfer based on employee skill set, service history which was earlier being done manually ,leads to wastage of Government resources, and time that too without fruitful results which created lack of faith in Government system. National Informatics Centre, Himachal Pradesh developed “eHRMS”, which brought a breakthrough in managing Human resource in Government efficiently and effectively. “Manav Sampada” was not only the solution to manpower planning but its integration with other e-Governance applications extended its ambit to various other Government G2G, G2E and G2C services. 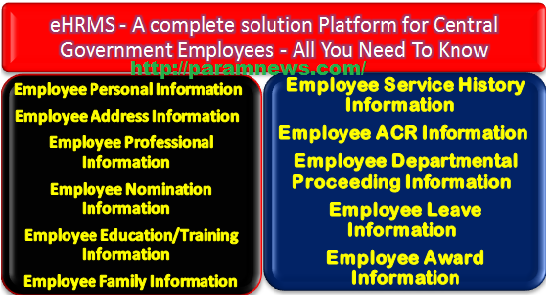 A complete HR solution for massive manpower of 2,34,705 employees of 146 Government departments posted in 27,918 offices of Government of Himachal Pradesh . To develop HR related databases for analyzing the skill set of each employee by collecting the information like skills, compensation, personal details, demographic information, and other detailed relevant information. To help Government in analyzing the status of manpower by calculating the current and future status of recruitment and retirement. To develop a Benefits Management System for calculating additional allowances and benefits provided to employees using details about insurance policies, pension plans etc. To preserve employees most useful information currently available in their manual service book record in electronic form (e-Service Book) and to create a Searchable Employee Service Book database through data entry of master service book and online transactions thereon. To make available eService book on the Internet supporting Governments effort to bring transparency in a user-friendly interface for use by both the department and Government employees. To achieve the objective of RTI Act with regard to employee posting and transfers. To develop work flow based product to eliminate paper use in the Government at various levels which will result in fast disposal of matters and thus improve the Carbon Credit Rating of the State by saving paper. To develop Outputs/Queries (on various selection criteria) at all the levels for effective policy decision making. Rapid Rollout and Productization of the application. National Roll out through DietY, Government of India – The project has been selected as National Product for Rapid Replication in the State of Jharkhand By Department of Electronics and IT (DietY), Government of India. The customized model of the Himachal model has been implemented in the State of Jharkhand and employees master data entry of all 82 departments are in progress. Productization : The existing Himachal Model of the HRMS application will be developed in a form of Product with feature like multi tenancy, content management, user specifics form customization etc. Features/Application Modules available in the HRMS Product. The application can broadly be categorised for following modules. Application Management – Modules for the developer to control the overall software flow, creation of role, menus, state administrator. Department Administrator - create department specific master, office hierarchy, upload department notification, news, logo, order formats etc. Office Administrator – employee registration, assign roles, create password etc. Personal Information–Basic Details such as Name, Father Name, Date of Birth, Date of Retirement, Identification Marks, Photo, Caste, Blood Group, Category, Current posting. Employee Award Information – Award specific information. Creation of online Transfer/Promotion/joining/Relieving Orders – The user can create, finalized and publish the various orders by selecting the concern employees directly through the application Online Filing of ACR Standardization of ACR Format- modified the ACR format and process of employee assessment in the 0-10 scale. Role based work flow process for ACR submission and their assessment by reporting and reviewing officers. MS based dissemination of ACR status to employees. Online Filing of Annual Property Return Each employee with authentic employee code/password can submit their APR for previous and current year. The information related to employee APR directly available on the portal. Year wise detail of employee APR is available for citizen and to Government at each level. PR Search Mechanism on the basis of value of the property, Total Income, Department and employee code. Online Leave Management Employee with authentic employee code/password can submit apply for leaves to their reporting officer and the reporting officer will approve/reject/cancel the leaves directly through the application. Online Tour Management The module is under development and will facilitate the employees to apply for their tour online in the application. Mobile App Android based mobile app to view transfer (eTransfer) orders and employee service book (eHRMS) on mobiles. Recruitment and Appointments Creation of online vacancies, acceptance of online application against a vacancy, generation of admit card, finalization of candidate selection and automatic employee registration in the eHRMS. Thus“eHRMS” was developed with following objectives of Good Governance, Complete information related to employee service book is captured in Manav Sampada software.